As the old saying goes, “variety is the spice of life.” The eclectic cornucopia of culture found in Toronto’s diverse population is one of the most interesting and engaging cultural aspects with which many of us from the Greater Toronto Area have grown to know all too well. So for us here at SDE Weddings, Toronto’s premier wedding videography, cinematography and photo-booth group, nothing is more novel and exciting than working with inter-faith and inter-cultural couples to create a work of art which reflects vividly the many and varied facets of their cultural interactions and experiences. A work which culminates in something as truly magical and beautiful as a mutual bond build from love. Such was how our videographers and cinematographers felt when working with Kingston & Russanthy on their interfaith Tamil & Catholic wedding events held just last year on July 3rd and 4th, 2015, with dual religious ceremonies held at Scarborough’s Canada Sri Ayyappan Hindu Temple and St. Rose of Lima Catholic Parish respectively. One day to commemorate and celebrate one ethno-religious heritage, and another the next, all becoming one as a whole in the end with a truly unforgettable wedding weekend celebration held at the ever luxurious Markham Convention Centre in Markham. And through it all, our videographers and cinematographers keeping vigilant eye on every magical moment as they unfold in sequence. Though Kingston & Russanthy are both Indian, their distinct religious traditions are a perfect reflection of the plurality and diversity which characterizes the Indian subcontinent’s vibrant history, and indeed is something from which we as Canadians of many differing backgrounds could draw an inspiration from. So come with us as we here at SDE Weddings reminisce our wonderful time working with Kingston & Russanthy on a once-in-a-lifetime wedding experience. It’s not often that one comes across a ‘perfect’ couple, in ordinary circumstances anyway. That’s why we here at SDE Weddings, Toronto’s premier wedding videography and cinematography group, feel almost blessed that we’ve witnessed plenty of ‘perfect’ couples pass through one of life’s largest landmarks, that of their wedding day. Such is why we felt more than blessed to work with Sonia & Mohit on their wedding celebration, that lasted not just one day, but an entire three-day weekend ordeal just a few weeks ago from December 4th, and the weekend of December 6th, 2014 which had a ‘sangeet’ party set at Mississauga’s Verdi Banquet Hall for the first day, and an impressive wedding-weekend spent at the ‘Renaissance Hall’ of Woodbridge’s Château Le Jardin. An extraordinary couple to say the least, our videographers and cinematographers had followed the two throughout their weekend-wedding, and had prepared a Next-Day-Edit to showcase for the final day of their wedding. Turns out, Mohit had something up his sleeve to keep our own film-makers on their toes for the final day. Keep your cursors scrolled to learn more about Sonia & Mohit, our videographers’ and cinematographers’ experience, and the couples’ wonderful weekend wedding. The expression of an “old flame” to describe a love or friendship from long ago naturally draws parallel to a kindling fire that, as relationships sometimes do, eventually inflame quickly and burn out slowly. However, the truest test of a couple’s love for each other is finding and forging a way to rekindle that same burning passion, that once-in-a-lifetime initial spark, and forcefully resurfacing these same impassioned feelings out of each other like a phoenix born from the ashes. Thus formed the setting for the reunion of Fuhreen and Hassan two years ago, after what seemed like a lifetime of being apart. The couple, who were very close friends in high school, had amicably parted ways in pursuit of higher education. As time passed, Fuhreen had successfully become a doctor and Hassan an engineer. Now in their late twenties, with their years in education behind them and an entire life beyond the horizon, their reunion after many years meant a twist to these two threads torn apart by time. Two years later, these same threads of fate would become entangled in each others lives, brought further and further together, that they’d eventually find themselves in midst of their families and friends and tying the proverbial knot. 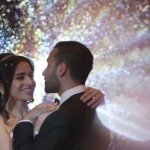 We here at SDE Weddings, Toronto’s premier wedding videography and cinematography group, find ourselves infatuated with stories like Fuhreen and Hassan’s, because they speak deeply to the nature of ‘love’, the grand motivator of what brings us all here, all together.